On the night of January 1st-2nd of this year, MSC Zoe, one of the largest container ships in the world, lost at least 345 containers during a spate of rough weather in the North Sea. About 150 of them were lost north of the German island of Borkum, another 200 or so southwest of that near the Dutch island of Terschelling. Whole containers and some of their contents — including electronics, toys, clothing, furniture and potentially explosive organic peroxides — were found on the shores of Borkum, Terschelling and the Dutch islands Vlieland, Ameland and Schiermonnikoog. With so many containers and their contents, some hazardous, adrift in the ecologically sensitive coastal waters of the Frisian islands, Dutch salvage teams have been scouring the North Sea bed to clean up the debris. A salvage crew working a busy shipping lane found wood beams and copper sheets from a shipwreck and alerted authorities. The Cultural Heritage Agency of the Netherlands dispatched maritime archaeologists to investigate the shipwreck. It wreck was approximately 23 feet wide and 98 feet long when intact with a carvel-built hull. It carried a large cargo of copper plates. Analysis of the wooden beams found the timbers were felled in 1536 and the ship built no later than 1540 in the Netherlands. The copper plates bear the marks of the Fugger family, a wealthy banking dynasty from present-day southwest Germany who in the 16th century owned numerous copper mines and had the monopoly on copper production. The ship was carrying both round and square copper plates. The round ones were up to four feet in diameter and .2 inches thick. Researchers believe they were probably used to make pots and pans. The square plates, on the other hand, were probably going to be used to make the copper coins. Chemical analysis indicates they have the same composition as the Netherlands’ first copper coins. Copper coins first came into circulation in the Netherlands in 1543. Before then only gold and silver were minted, and they were the province of the wealthy. The introduction of copper coins allowed the working and middle classes in the rising urban centers of the country to engage in the burgeoning cash economy. 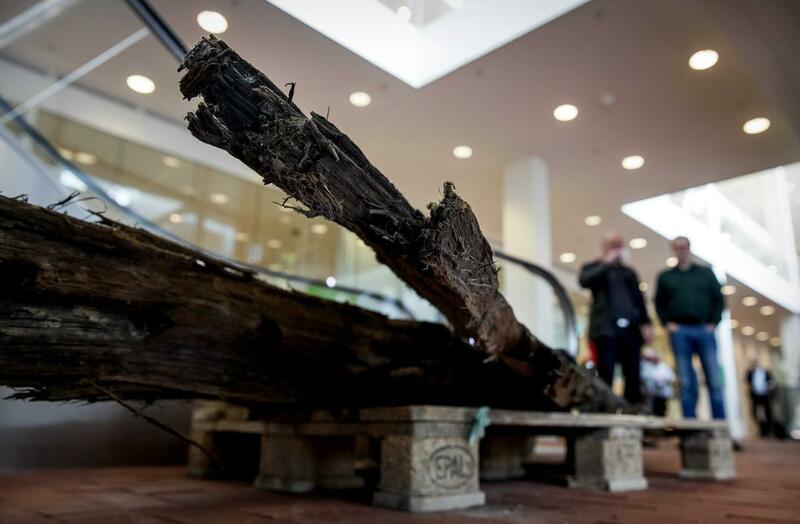 The 1540 date makes this ship the oldest sea-going vessel ever discovered in Dutch waters. It is also the oldest known caravel-built ship, which makes it a uniquely significant artifact of the shift from the small clinker-built ships of the Middle Ages to the large oceanic vessels that made the Netherlands a great maritime power. 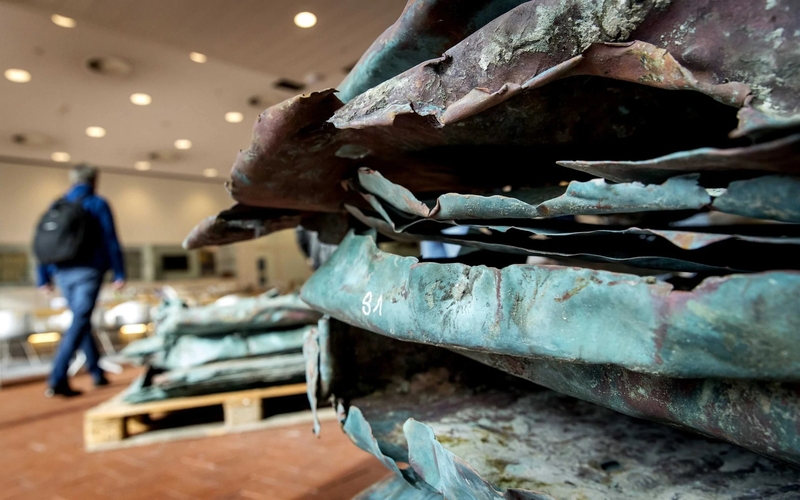 “A lot of people think of the Dutch as a maritime nation, and this ship tells us something about how we became that nation,” said maritime and underwater archaeologist Martijn Manders. Mr Manders said this shipwreck is of great importance because it dates back to a period where ship-building technology was in a transition from the medieval period to the Dutch Golden Age. Archaeologists will return to the site, whose exact location is being kept under wraps for now, next summer when wind conditions and temperatures are more conducive to exploration. They hope to reveal more of the ship’s hull, much of which remains covered in sediment. The Coast Guard and Heritage Inspectorate will patrol the shipping lane in the interim to protect the wreck.